Magna-Ject Wax available in pink and blue (extremely fluid) Provides excellent fill in the most intricate filigree. Built-in release agent. High-durability and non-brittle. Holds up to moderate handling, carving and shaping without adverse effect. Low injection temperature keeps pattern shrinkage low. 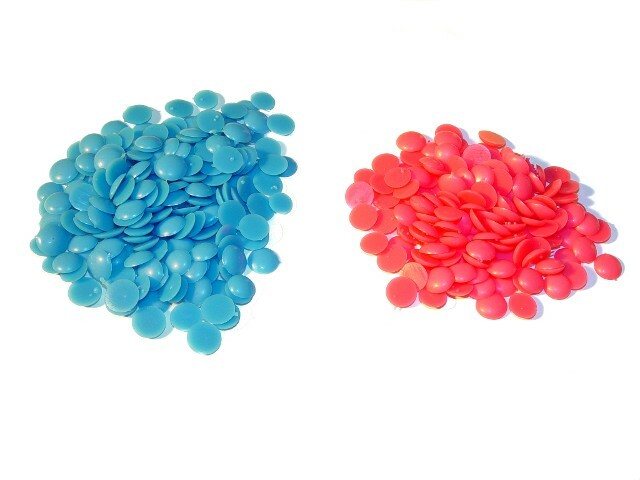 Ultra-Ject general purpose grades available in Aqua, Turquoise, Ruby Red, and Blue offers excellent flow and are self-releasing. A medium-hard, medium-tough wax with good ductility and memory. Slightly less fluid than Magna-Ject, but still more than adequate for almost all types of designs. Copies fine detail very well. Not as sensitive to thermal abuse as Magna-Ject waxes. Plasti-Ject Blue carries the highest ratings for toughness and hardness. Can be carved, filed and worked with rather aggressively without risk of breaking down. Provides fine detail replication, but higher viscosity and extra durability makes this wax more suitable to larger, open-style pieces than to more delicate, lacy designs. Buckle Pink is ideal for flat heavy castings. Particularly desirable where low-sink properties are an important consideration. Very good flow characteristics and low shrinkage. Average flexibility and memory. Not well-suited for carving applications. Does not contain built in release agents. As with most injection waxes it is compatible with steam de-waxing.